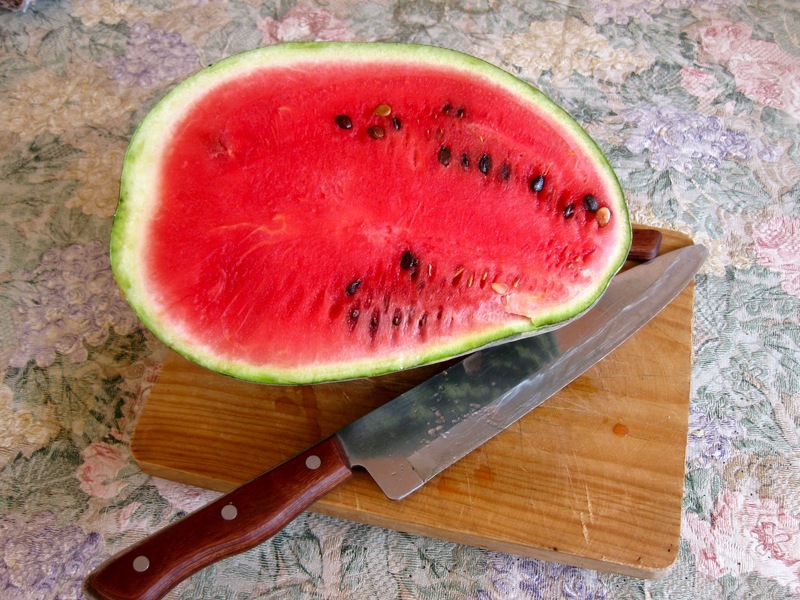 Yesterday morning I picked a watermelon from our mostly-dried-up garden. Yes, really – just a few days away from Thanksgiving. Lest you think we have been enduring a long heat wave, well, the weather has been cold in the nights, but still quite warm in the afternoons. 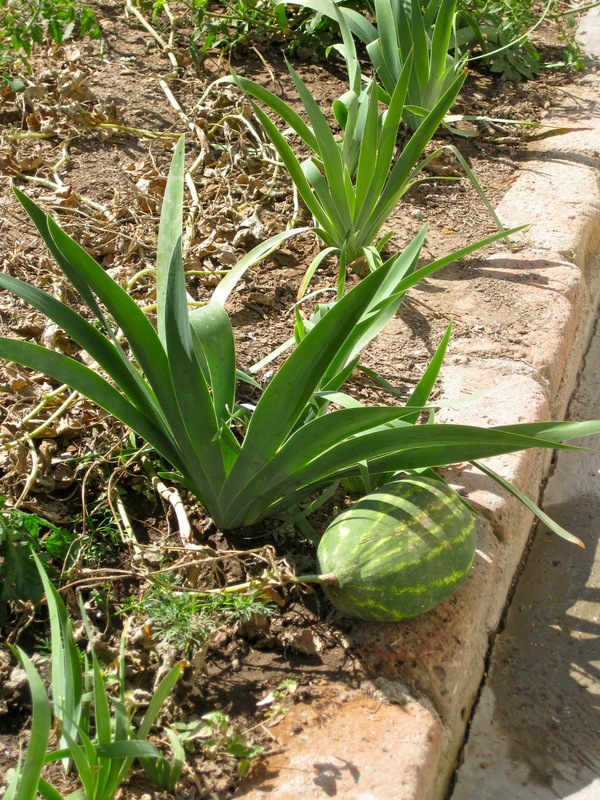 I did not expect anything at all from the volunteer watermelon plants that came up in our garden, but we just let them stay, twining all around the garden. I thought the melons would be just – blah. We had learned some lessons about pill-bugs and watermelons over the summer, and I had placed the baby watermelon on top of a ceramic bowl about a month ago to protect it. Its mother vine dried up a couple of weeks ago, but we left the melon sitting there on its little throne because it just didn’t have that hollow sound of a ripe melon. But I decided we had waited long enough for whatever was going to happen, and when I cut it open it made that crispy sound you like to hear as it split. And guess what? It was delicious! Really good! Who would’ve thought? I cut it up in bite-sized pieces. That is a really good solution to an everyday problem of not-much-food-and-quite-a-few-people, a common practice with all kinds of food here. I didn’t do anything else to it, but usually people sprinkle the pieces with lemon and chili. Ten or twelve of us enjoyed eating it. Now I’m eyeing the next little watermelon for an autumn treat. To quote my friend Michael, happy Thanksgiving, everybody. I do hope you all have a safe, happy and loving week. My thoughts, exactly! This entry was posted in Uncategorized on November 21, 2011 by gubabbaboy. Around midnight last night I could hear Chon moving around the room. He said he heard the church bell ringing “doubles”. That is an announcement of death. He went out to the street but saw no one. Later on, very early in the morning, we woke again, hearing bells. Tio Kiko was waiting at the door at sweeping time. He went in, as he always does in the morning, asking about Socorro (still asleep) and Chon (still asleep). He has to check anyway, and is not satisfied until he finds their doors closed. Then he told me that his compadre Enrique died in the night, and his body was there at the house. This was not really a surprise, as they took him yesterday to the hospital for the umpteenth time. 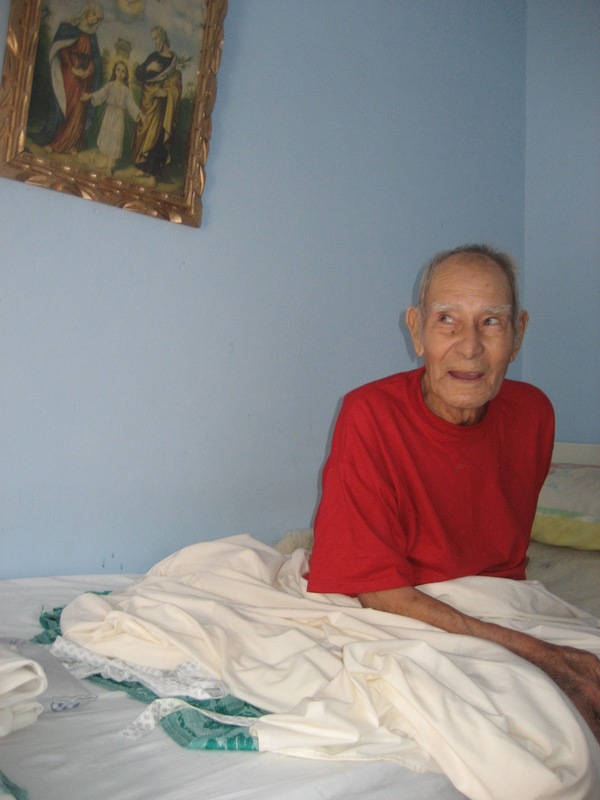 He lacked three weeks of reaching his ninetieth birthday, and his many serious health challenges had kept him bedridden for years. A few minutes later, the news came that Don Geronimo also died last night. The bells we heard early in the morning were from the next rancho to the east, ringing his death. The families in these small towns are very closely related. Don Enrique’s granddaughter who has cared for him for the last few years is also the granddaughter of Don Geronimo. Last night both of her grandfathers died, and people are whispering about that. Nobody cane recall that ever happening before. The first day of November brought sudden cold weather, freezing the crops, and people say that the cold weather brings “bad things”. The town is full of people suffering from colds and coughs. When we visited the fields in the morning we could see ice crystals sparkling in the sun. Chon’s sister Maria and his mother both have persistent coughs, and we have been sharing home remedies with them. In the mornings Socorro says her morning prayers, interrupted by frequent coughs. She prays on doggedly in a strong voice. Coming to the end of some prayers, she continues on and on with more. She mentions death several times a day. She will be 90 in December, and suffers from a painful old knee injury, and right now from a constant cough. Surely every adult in this little town will have many thoughts of death today and during the nine days of novenarios for the two old men who died the same night. This entry was posted in rancho life in Mexico, retirement in Mexico on November 20, 2011 by gubabbaboy.